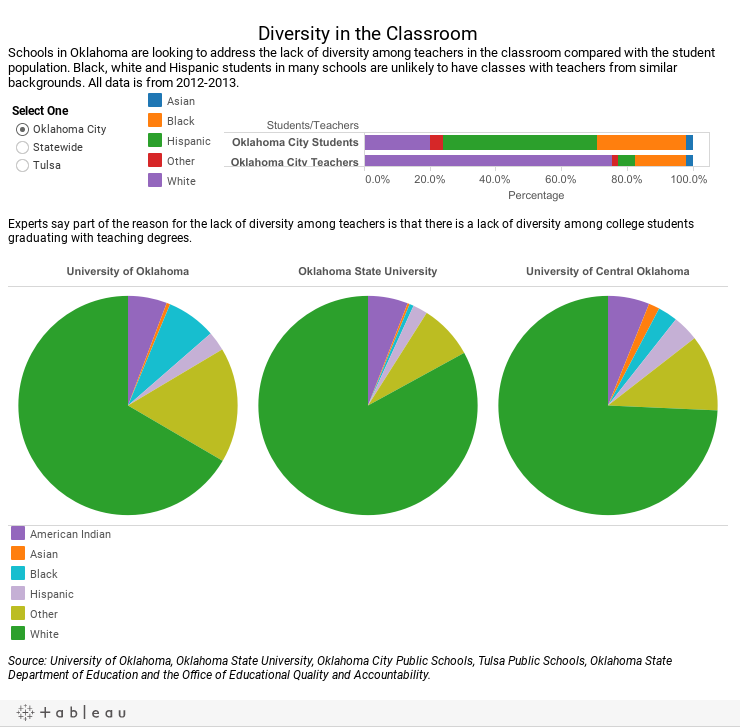 Diversity in Oklahoma classrooms is increasing, but the teachers leading them remain mostly white. Public school districts across the state and the nation are scrambling to address the racial and ethnic disparity between students and teachers. School leaders and education experts say a more diverse teaching corps is needed to establish positive role models for students and to better ensure teachers connect culturally with students. Only 25 percent of Oklahoma City Public School’s teachers were black, Hispanic, Asian or American Indian during the 2012-2013 school year. About 80 percent of the students were people of color. In the Tulsa Public Schools, 21 percent of teachers were from those minority groups, compared with 64 percent of the student population. Oklahoma Watch gathered the data from various sources for the same school year, 2012-2013. Teacher data was provided by the individual school districts and the state Department of Education. Student data was provided by the state Office of Educational Quality and Accountability. Talia Shaull, chief human capital officer at Tulsa Public Schools, said increasing teacher diversity is a priority in her district. Oklahoma City Public Schools spokesman Mark Myers said it’s important for students from large urban districts to have teachers from similar backgrounds they can connect with. The district recently hired teachers from Puerto Rico in response to the district’s growing Hispanic population. About 47 percent of the district’s students are Hispanic. “It makes the transition much smoother in the classroom for students who come from Spanish-speaking households,” Myers said. He said that hiring diverse teachers also makes it easier to interact with parents who may not speak English. Recruiting any teachers in Oklahoma is hard right now due to various factors, including low pay, Shaull said. It’s even harder to find teachers from minority groups. Robyn Miller, the Oklahoma State Department of Education’s deputy superintendent for educator effectiveness and policy research, said teachers of color are leaving at a higher rate than white teachers. The factors that drive turnover the most are similar for all teachers – relatively low salaries (minimum starting salary is $31,600), increased stress because of testing and other demands, and struggling to forge academic growth with low-income populations, experts say. Teachers who are minorities tend to work more often in high-minority, low-income schools; thus the risk of burnout for those teachers is greater. “The teachers serving high poverty, minority students are in less desirable workplaces,” Miller said. One result of this trend: The least experienced teachers tend to work in the Oklahoma City and Tulsa metropolitan area districts, which generally have higher levels of students of a low socioeconomic status, according to a report released by the state Education Department earlier this year. The state has created a task force to address teacher recruiting and retention challenges. The education department also makes an effort to provide scholarships to people of color so that more opportunities are available and districts can begin to close the racial gap, Miller said. Miller said the department is dedicated to improving working conditions, including by giving teachers more autonomy in the classroom. “We need to be aware of allowing them to be more instructional leaders and have that autonomy and decision making at their schools,” she said. Other approaches are implementing more mentoring and professional development programs, Miller added. Developing talent can start in high school. Oklahoma City is working with the University of Central Oklahoma to provide high school graduates a free education if they agree to return and teach in the district for a certain amount of time. The goal of developing more “homegrown” teachers is that they will better reflect the diversity of the district’s students, plus the added teachers will help relieve the overall teacher shortage. More homegrown talent also could broaden the diversity of new teachers emerging from the state’s colleges and universities. During the 2012-2013 school year, 67 percent of students who graduated with an education degree at the University of Oklahoma were white. Black students made up 7 percent, and Hispanics 3 percent. About 74 percent of education graduates were white at the University of Central Oklahoma during that same period. Black students were 3 percent of the graduating class and Hispanics were 4 percent. Note: Some percentages from school year 2013-2014 were incorrectly included in an earlier version of the story. All of the percentages are now from 2012-2013, the latest year for which such data was available from both K-12 schools and colleges.